Since I had just a few peach and gray beads, I put them together in Drawer 15 and they have co-existed over the years. While rummaging through the drawer, I was excited to find two strands of gorgeous peach aventurine to feature this week. Aventurine is a crystal with a lot of quartz in it, mostly opaque and often green, leading some to incorrectly identify it as jade. Peach is a lesser known aventurine color which is achieved by the presence of the minerals orange mica and pyrite (aka “fools’ gold”). These minerals are said to enhance creativity. When I found the four large peach aventurine ovals, I knew I had enough to make a two-strand necklace! Notice how the sparkle of the coppery seed beads brings out the brightness of the minerals. 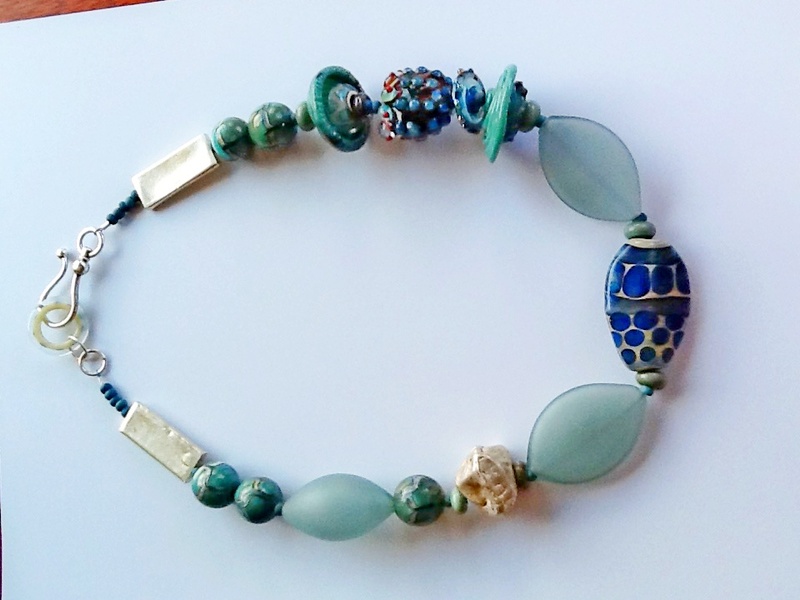 The highlight of the necklace is the lampwork glass creation of Gail Crosman Moore. Gail is special to me: a familiar face at the many CA bead shows where I shopped; she is from Western MA; and she is a redhead! Mostly she is a truly creative artist as she wields colorful glass canes in one hand and in the other hand, she shapes the molten into a unique bead, all while wearing protective gear in front of flame! Shaped like a bell, the centerpiece is peach with striations of green and blue. The bottom has beautiful blue pods waiting for your caress. Read Gail’s website and be sure to note her shop in P-Town! 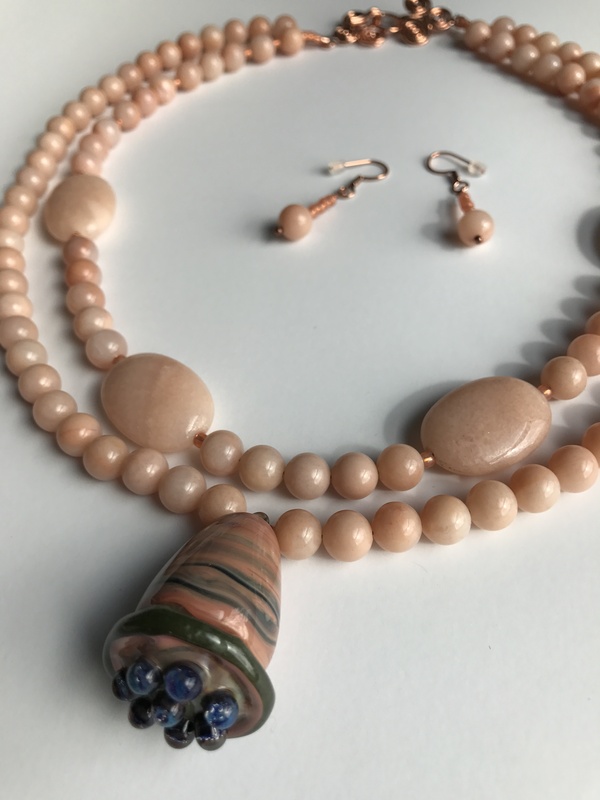 This necklace demanded a copper clasp and is accompanied by a simple pair of copper and aventurine earrings. It is 20” long. $115. I’m challenging myself in 2017 to create one necklace a week using the beads from one drawer of my 52 drawer Apothecary Chest. Welcome to Drawer 6. Judging by my mail since last week, Valentine’s Day is pretty soon. The MFA issued a lush brochure announcing its revival jewelry exhibit opening February 14; Chico’s wants me to come in and accept a free necklace; HullArtists.com’s own Gallery Nantasket invites everyone the Sunday afternoon before Valentine’s Day; even my inbox is exploding with jewelry created for the occasion! I too must rise to this annual red heart fest. Once in the over-flowing red drawer, I couldn’t stop myself—so I made three necklaces! 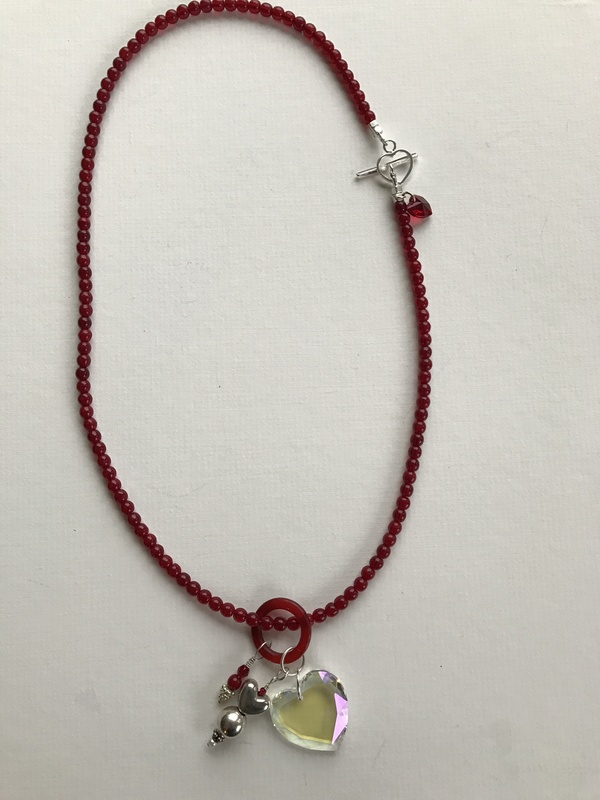 #2 is featured at the top of the blog and is created with trade beads only. The true definition of a trade bead is a glass bead made in Venice and traded around the world, especially in Africa , from the 16th to the 20th centuries. My definition is they have patina which is evidenced in chips and crevices darkened by the dirt of ancient markets as they are bartered and change hands. 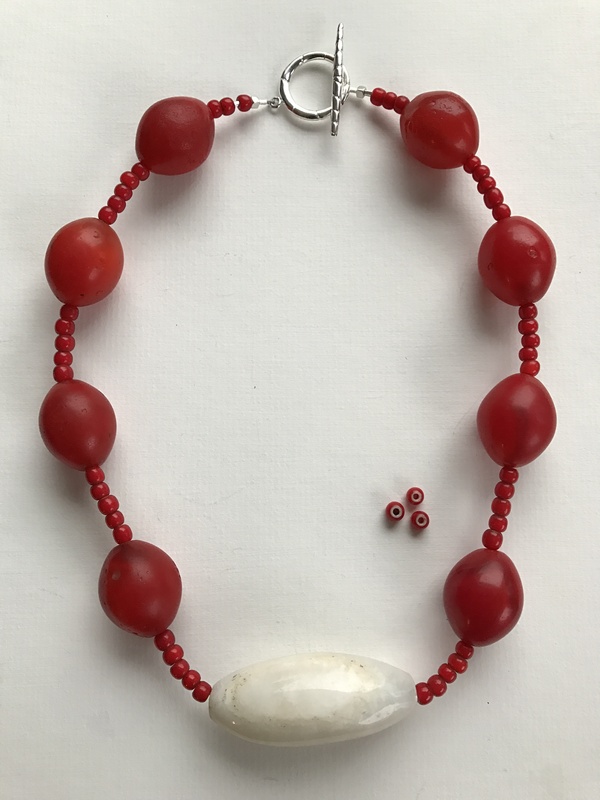 The larger red beads are glass made to look like faux amber, the agate center bead has that trade patina, and the small red ones are called white heart beads and have a long history. 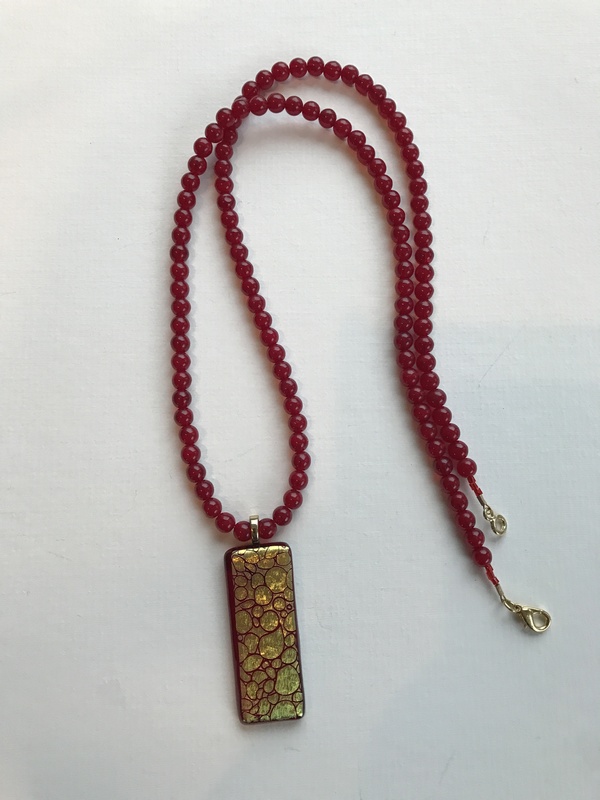 Red glass beads were historically made with gold. In 1480, beadmakers added a white layer at the core of the bead (see photo) to reduce the amount of gold needed. Production of white hearts was finally ended in 1960. It is 22” long. $69.00. Teal windsocks on cross streets in Hull will mark the locations for fascinating studios where real artists work! Please visit me in my studio in Hull Village on July 9 or 10, Saturday or Sunday from 10am to 5pm. 23 Andrew Ave (3rd Left after Library on Main St), Hull. Be prepared to find newly designed Beadleful necklaces, lots of my trademark chunky bead jewelry, some bracelets and earrings! Also, Marilyn MacDonnell returns with fabulous totes, key chains, purses and a new line of beach towels! 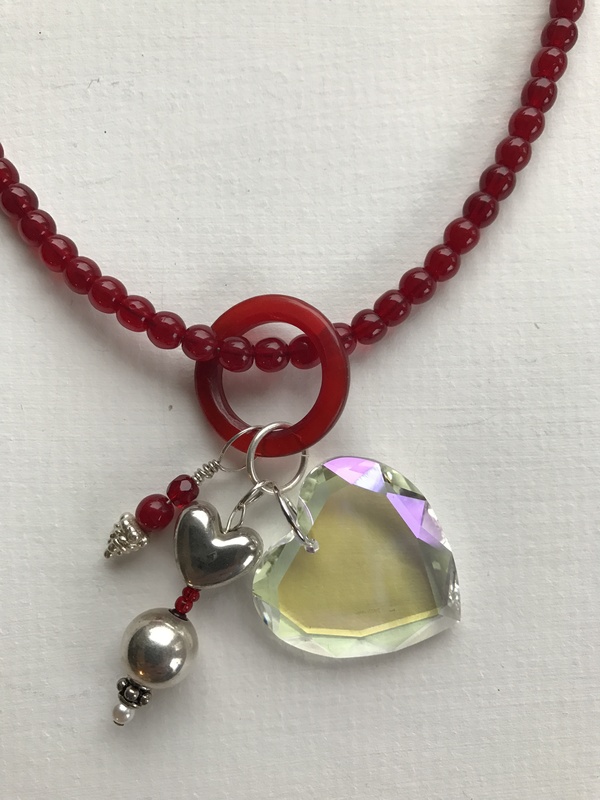 Local women artist’s lampwork beads feature in this necklace with silver clasp. This wondrous necklace is sort of like a “One-of-a-Kind” (see blog dated Aug 7, 2013, “Oh, Oh, OK” for an explanation), but then again it’s not. It is an OOK if I count only half of the beads as OOK. It is not an OOK since most of the beads are artist made. Enough of acronyms! Let us explore this amazing necklace full of lampwork glass beads made by some awesome women! Envision long sticks of colored glass, a source of fire coming from a mini blowtorch on a stand in front of the artist, and a metal mandrel. Sit our artist down facing the fire, mandrel in the dominant hand to shape the glass into a bead, and, with her other hand, manipulating the glass rod as it heats up and goes molten. This is Lampwork Glass. I collect these beads as I go to bead shows. 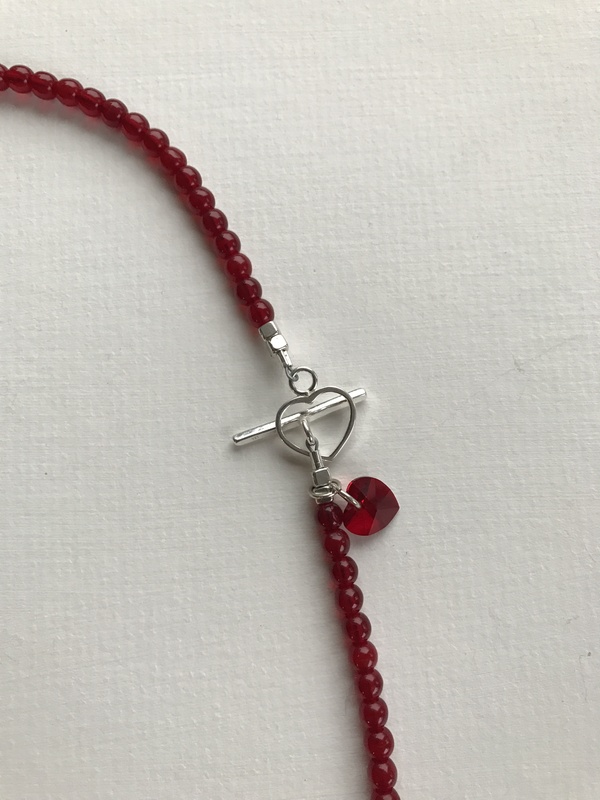 Not for me, even though I am an incurable collector, but for you, wearers of my necklaces with these precious beads in them. Identifying the artists whose beads make up this necklace is a special pleasure. Sheila Checkoway’s beads and small fat discs feature first; starting from the silver clasp, after the sterling silver bar, are two of five of her beads followed by a small fat disc, one of six by this Massachusetts native. Then we see one of two umbrella-shaped discs by Maureen Henriques of Pumpkin Hill Beads (MA) with a polka dot circle by Kennebunkport Bead Art. Now find a Gail Crosman Moore (MA) bead, chubby and squat with bumps all around and more bumpy stuff happening on top. Gorgeous in its excess! Next is a modest disc (one of these gals has to do “modest” to ground all these blockbusters!) by “Two Sisters” whose shop in Carmel-by-the-Sea in CA is not to be missed! Another Henriques umbrella shading a Two Sisters disc follow. Then three Venetian glass beads which are blown (see blog dated Sept 20, 2013, “Murano Island Rising”) in a pale grey green. The centerpiece lampwork is a fabulous design by Gail Crosman Moore whom I discovered in a show in Oakland, CA, over ten years ago. I was impressed not only with her work but by the fact she lived in Western Massachusetts! Now she has a shop in Cape Cod at 174 Commercial St, Provincetown. Starting up the other side, notice a faux silver bead (cheap but high style) plus more Sheila and Venetian beads, back up to the silver bar. The clasp is another piece of work, as they say colloquially. 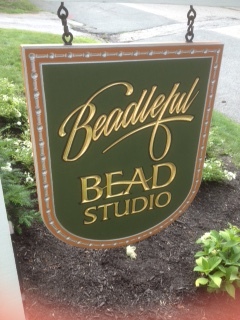 An artful hook, although not artist-made, grasps a glass polka dot circle by Kennebunkport Bead Art. This was a slowly percolating necklace that took years to come together. The color is odd but soft and surprisingly neutral. Perhaps it is best described as teal grey. Gail’s beads add a teal blue. My luck held out with the seed beads I found in my drawer—an interesting blueish green teal in matte Czech glass, not shiny. The necklace is for sale. No way could I hoard this! It is for sale in my studio for $220. Add $15 for mailing and insurance and it is yours. It measures 20” long. 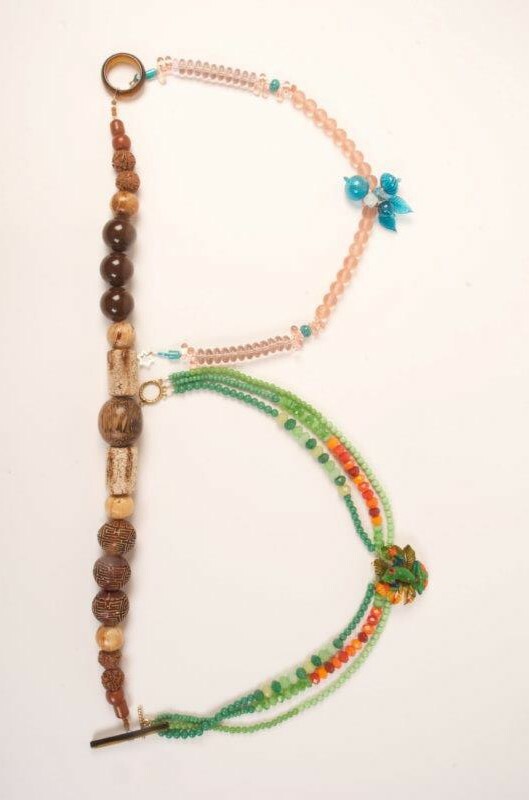 After 20 years, I am retiring my old logo of necklaces in the form of a “B”. This is a good moment to thank Don Beadle for my fabulous last name! Stay tuned for the new logo…hint…it’s orange. “Would you like to move to Hong Kong?” Don’t the most fun things begin with a question? My husband was offered a job assignment in Hong Kong in 1993, so I resigned from my Human Resources job and went along for the adventure. Hong Kong is a shopper’s paradise, and I soon discovered I was attracted to beads. When I filled up my drawers and started putting boxes of them under the bed, my husband asked me why I had so many beads. My future became destined when I blurted out, “I’m going to make necklaces!” So I set out to do so. I thought my designs looked pretty fine, and, wisely, took a class to learn the fundamentals. As a final judgment to my opinion on the attractiveness of my necklaces, I submitted them to the 1994 annual exhibit of the Royal Crafts Guild of Hong Kong, and was accepted. In 1995, I decided I was retired from my corporate life. Bead jewelry became my business. I wanted the risk of succeeding or failing. It could never just be a hobby for me. 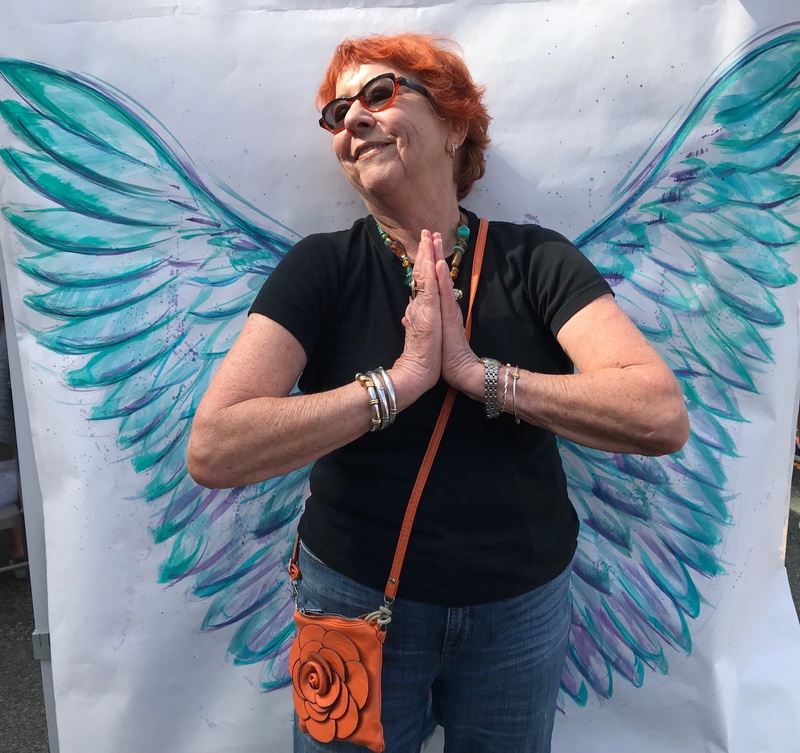 I took that brave step at the Silicon Valley Open Studios and loved every minute of it. I still love the challenge of offering my work for sale: it’s an instant thumbs up or down and it gives me feedback. A thumbs down means that necklace gets taken apart at the end of the year and gets another chance at greatness. Here we are in 2015. 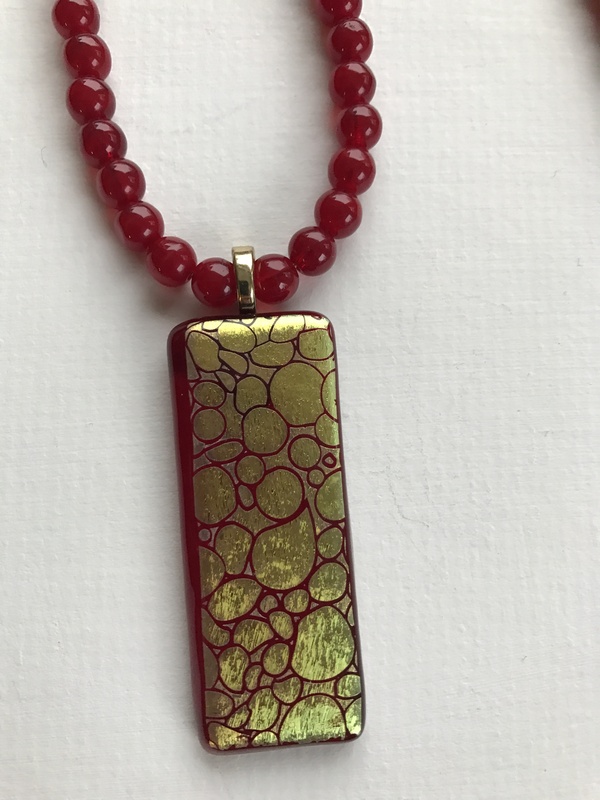 I have made nearly 2700 necklaces; I never tire of the search for fabulous beads; and I still try to spend at least two hours several days a week in my studio. I have changed marketplaces three times: from Silicon Valley to San Luis Obispo to the South Shore of Boston. I love change! In 2015, I am working on being “Stupendous in my Seventies” and, when the time comes, “Energetic in my Eighties!” All for the love of beads! 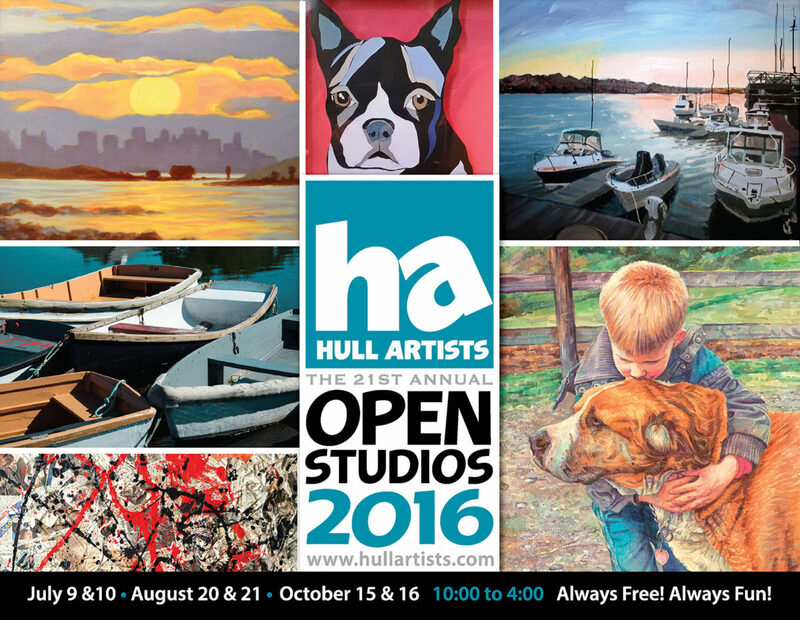 Please visit me in my studio in Hull Village on Saturday or Sunday from 10am to 5pm. 23 Andrew Ave (3rd Left after Library), Hull. 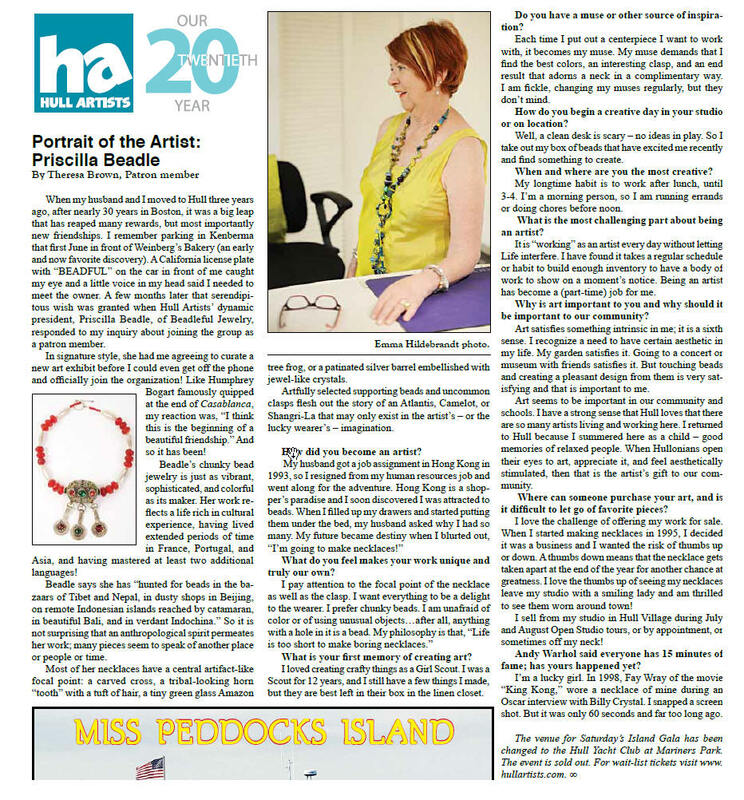 IT’S MY 20TH ANNIVERSARY AS A BEAD JEWELRY ARTIST! Do you know I made my 2773rd necklace yesterday? Ok, that number includes a few bracelets and earrings. I gave myself a present: a carved wood sign with a “beaded”edging in the middle of my garden near the street. OK, winter 2015 ruined my old sign. Let me know what you think of its replacement.